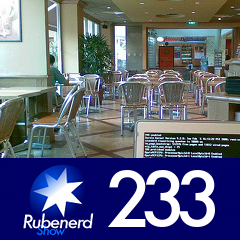 1:23:03 – Recounting childhood memories and obsessions from Melbourne, Ikea furniture, Lego, is Starbucks having a positive effect, my favourite coffee house closing, improved coffee quality, rant about public transport (are we better building new damned giant roads or new train lines? ), general public's perception of security is wrong (YOU are the biggest security threat! ), getting fascinating Bruce Schneier books for my birthday, security companies screwing consumers, using a non-administrative account on Mac OS X, comparing building your own computer and open source software to hot rod builders, being a 1990's kid, running Windows software on Linux and FreeBSD with Wine, why it's a great time to be alive, comparing open source software developers to independent musicians, thanks to Jim Kloss and Esther Golton for the inspiration, sorry for the sacrilegious comparison! Are people worth what they're being paid? Who's deriving more happiness from what they're doing? Older post → A silly happy birthday Elke!